It’s the opposite of a boycott. 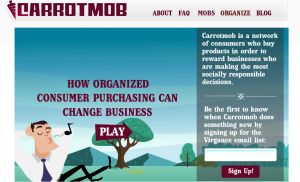 The C-mob encourages small businesses to become more green by rewarding them with a “mob” of customers. They are world wide. The next San Francisco Carrotmob is scheduled for Bernie’s, 3966 24th St on Sunday Oct 18, 11am – 2pm. Become a mob member and get shopping alerts sent to your in box. More info about carrotmob here.